A big congratulations to Jeff and Katie as they begin their marriage to one another. 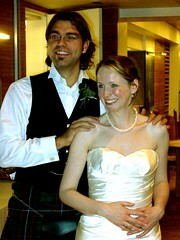 Their wedding was lovely, one of the loveliest weddings I've been to. Not too formal, but not informal either. Just right. Katie's family is lovely, Jeff's family is lovely, I can't think of a better word to describe the whole event other than 'lovely'. Oh and of course, Jeff and Katie themselves are very lovely.